The GDA are calling on local businesses to support its vital services. We are sending each one a flyer asking them to give us a hand as we work to support our 40+ disability charities and individual members. This year, the GDA is celebrating its 10th anniversary. 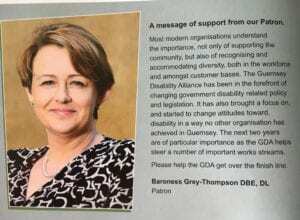 Now, as then, it is vital that we work in partnership with the community to increase equality of opportunity for the 13,000+ disabled islanders and their 4,000+ carers. We want to change the way Guernsey thinks about disability, so that everyone has the chance to take a full and active part in the life of our island. * Thought Leadership: We provide research, reports, briefing papers and the like to improve the quality of changes to policy and process. * Membership Services: we bring together the voices of more than 40 disability charities & groups, as well as those of individual members, to share knowledge, ideas, and concerns so that together we can work to reduce the barriers to social inclusion in Guernsey. We coordinate information, signpost services, run meetings around key issues, and provide feedback on policy and processes to business and government. ial media. Hard copies are provided for those who require them, and to 15 public locations across the Island. * Community Services: We provide information about improving disability awareness, we signpost services, run educational workshops, and offer training sessions designed to improve Guernsey’s understanding of language issues, etiquette, access and more. We also partner with other groups to increase knowledge of the principles of equality and we help others to become more disability confident (e.g. Scouts disability badge, work in schools, etc.). We work with other sector groups to increase participation in sport, leisure pursuits and community activities (e.g.the Saffery Rotary Walk, etc.). * Business Services: We are building partnerships and offering services to the business community to increase disability confidence. We offer educational workshops on customer service, access and legislation updates. 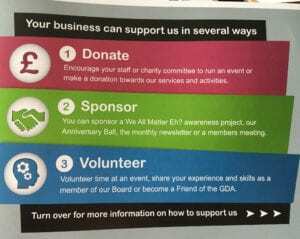 projects, running fundraising events) by sponsoring one of our services, events or We All Matter, Eh? Campaigns, or by making a donation. For more information, visit our website: http://disabilityalliance.org.gg/support/. Why not book a meeting with our team to discuss all these services and options further. 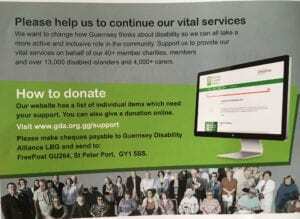 You can e-mail us at info@disabilityalliance.org.gg.